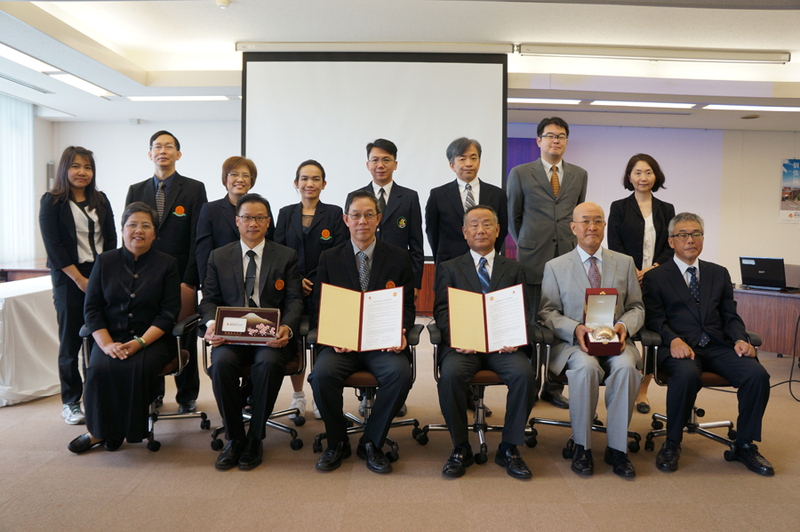 The University of Shizuoka School of Pharmaceutical Sciences and the Thammasat University Faculty of Medicine in Thailand recently formalized their collaborative relationship. A signing ceremony for a Memorandum of Agreement (MOU) between the two universities was held at the Kusanagi Campus of the University of Shizuoka on August 30, 2017. Nine guests from Thammasat University, including Dr. Preecha Wanichsetakul (Dean of Faculty of Medicine), were welcomed by delegates from the School of Pharmaceutical Sciences: Dr. Yoshiyuki Kagawa (Dean), Dr. Takashi Suzuki (Dean of the Graduate School), Dr. Yasuyuki Imai (Vice President), Dr. Tomohisa Ishikawa (Associate Dean), Dr. Satomi Onoue (Professor), and Dr. Junko Kurokawa (Professor). Following opening addresses by the deans of the two faculties and brief introductions to the two universities, Dean Kagawa and Dean Wanichsetakul signed the MOU. Afterwards, attendees joined in a group photo. This MOU formalizes plans for mutual exchange visits by young researchers, as well as for scientific collaboration between the two faculties. 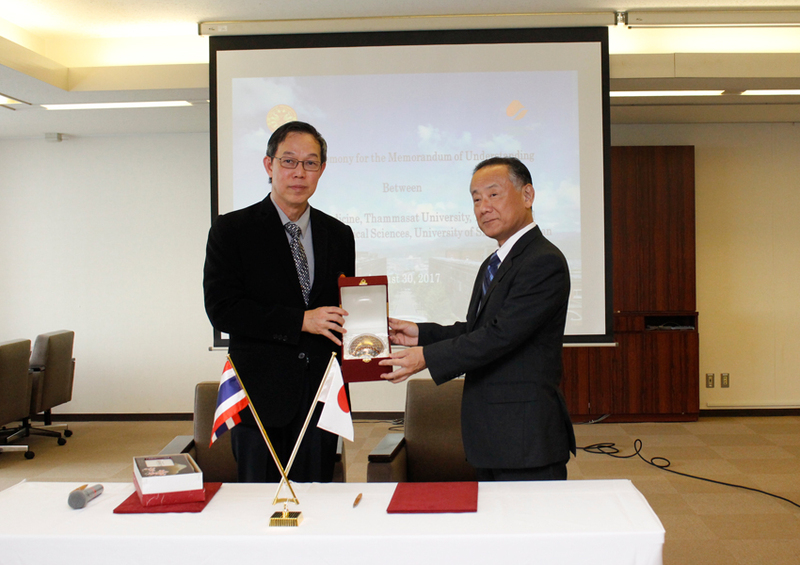 Possibilities for further collaboration between researchers in the medical and pharmaceutical sciences were discussed, including plans for the next visit of Thammasat faculty and students to the University of Shizuoka. Future plans include visiting the Medical Frontier Center building at Shizuoka General Hospital, where the University’s Pharmaceutical Education and Research Center is located. The delegates also discussed possible sources of funding for Thammasat graduate students, post-doctoral fellows and researchers to carry out research in Japan, and the status that they will have at the University during their visits. The guests were also given a brief tour of laboratories in School of Pharmaceutical Sciences to begin to develop concrete proposals for future collaborative research.